You are currently browsing the tag archive for the ‘whirlwind’ tag. Playful Pluto consists of several loose gags around Mickey and Pluto in a garden. It contains Mickey’s first encounter with a little whirlwind, which he manages better than his second one in ‘The Little Whirlwind’ from 1941. 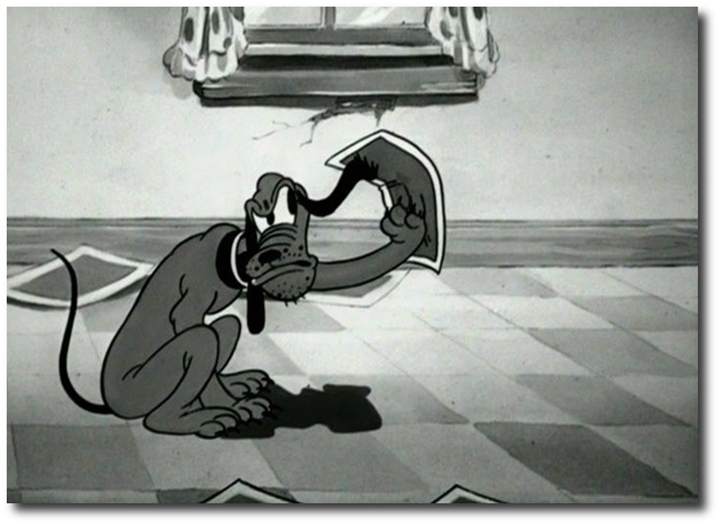 But ‘Playful Pluto’ is most notable for the now famous flypaper sequence, in which Pluto gets caught in flypaper. This is an important scene in animation history, because it’s the first time Pluto is seen as a thinking character. Not only that, it is arguably the first believable animation of thought processes. This illusion of thought is achieved solely by pantomime animation. The flypaper scene elevated its animator, Norm Ferguson, to the eternal hall of animation fame and it showed how laughs could originate in character animation alone. This sequence not only raised the standards of animation of Pluto, but of character animation in general. As to celebrate its success, this scene was remade in color for the Donald Duck short ‘Beach Picnic‘ (1939). At the same time, this cartoon shows how character-based gags could slow down the pace. This was an unfortunate side-effect, for this high pace had been painstakingly achieved in the Mickey Mouse cartoons during the previous years.